The striped cucumber beetle is the most important insect pest of cucurbits (i.e., cucumber, squash, watermelon and cantaloupe). This insect is responsible for more insecticide applications on cantaloupes than any other pest in Indiana. Both the adult beetle and the immature stages (larvae) feed on watermelon and cantaloupe. Larvae feed on roots and stems at or below ground level. This feeding is seldom noticed, but can kill seedlings and reduce the growth of larger plants. Adults feed on the leaves and stems of the plant and can be found feeding under the canopy, or at the base of the plant. Although adults feeding on the stems can kill young plants, the most severe damage is caused by the transmission of a bacterium, Erwinia tracheiphila (E.F. Smith) Holland, that causes bacterial wilt in cucurbits. Striped cucumber beetles are approximately 1/3 inch long with black heads, yellowish bodies, and 3 black stripes running the length of their wing covers. Western corn rootworm adults look remarkably similar to striped cucumber adults. However, striped cucumber adults have black abdomens, while western corn rootworm have yellow abdomens. Beetles overwinter as adults on edges of fields or in woods under litter or other plant debris. In late April or early May, beetles begin to emerge from their overwintering areas and feed on wild cucumbers and tree blossoms. Once watermelon or cantaloupe is planted, the beetles find and rapidly infest these preferred hosts. This initial infestation is usually the largest of the season. Beetles can be found feeding on plants within 24 hours after transplanting. The length of infestation is variable, running from a few days to a few weeks, depending on weather and other factors. In northern parts of Indiana, the beetles’ appearance is usually more gradual over the entire season. Therefore, beetles may be found in moderate numbers at any time during the growing season. Early in the season, beetles feed extensively on leaves and stems. During this early part of the season, beetles mate, and females lay eggs in the soil at the base of the plant. The yellow, oval eggs hatch in 5-8 days into white, worm-like larvae that feed on the roots. Larval feeding lasts for 14-20 days and can kill, or stunt seedlings and small plants. The larvae then pupate underground and emerge as adults from late June to mid-July (late July in northern Indiana). Adults remain active until fall. The second generation adults usually have little impact on plant growth, but may feed on developing fruit, making scars or pits in the rind that render the fruit unmarketable. Adults, but not larvae, carry a bacterium (Erwinia tracheiphila) within their gut and on their mouthparts that causes bacterial wilt in susceptible cucurbits. Cantaloupe and cucumber are very susceptible to bacterial wilt, but watermelon is not. Beetles harbor the bacterium in their gut over the winter or acquire it from wild plants before invading melon fields. The bacterium is introduced into the plant only when the beetles feed. Once the plant is “wounded,” bacteria enter the wound either from the beetles’ mouthparts (seldom during the early season) or its feces (most likely source of infection). Very few beetles actually are able to infect a plant, although the percentage increases through the season, and depends on the amount of time beetles are allowed to feed on the plant (Table 1). Therefore, early detection of beetles is essential for good bacterial wilt control. Even so, when populations of beetles reach densities of 10 to 20 per plant, many plants will become infected with the bacterium in a relatively short time. Bacteria are not capable of actively infecting plants. They must move into the plants through wounds and by free water. Water must be present for large percentages of plants to become infected. Therefore, rain or dew at the time of intense beetle feeding can significantly increase the incidence of bacterial wilt. Once plants are infected, there is no way to stop the progression of the disease. The bacteria multiply in the water conducting tubes of the plant and stop the flow of water. Plants begin to wilt anywhere between 7-21 days after infection. 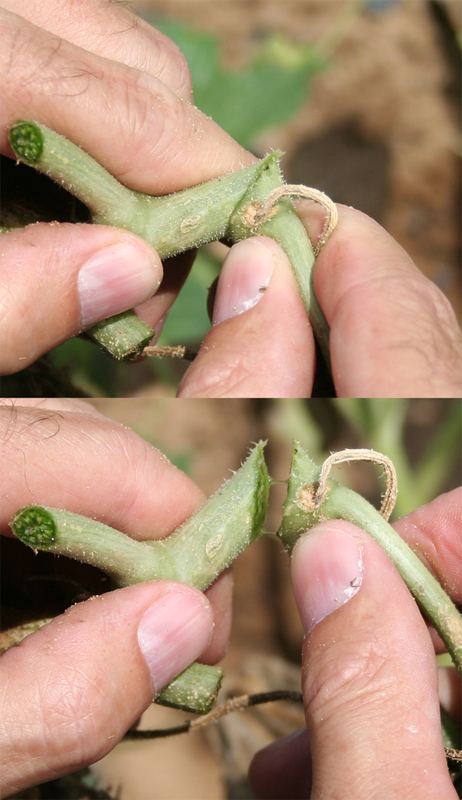 The disease can be diagnosed in the field by cutting through the stem at the base of a wilted plant and holding the two cut ends together for 10 seconds. As they are slowly pulled apart, a white viscous “sap” will appear as a string between the two cut ends. This stringy sap is actually the bacterial slime in the water-conducting tubes. Confirmation of infection by bacterial wilt pathogen. Top photo is a before and bottom is after pulled apart. After plants are set in the field, they should be watched closely for the first appearance of the beetles. Beetles usually are worse along the field edge, but large groups of them can be found randomly throughout the field. Therefore, the entire field needs to be walked to find these pockets of beetles. Video confirming presence of bacterial wilt in cantalopes. Beetles usually come into a field rapidly, and within 8-12 hours a field with very few beetles can become a field with many beetles per plant. Because the incidence of bacterial wilt infection is greater when beetles feed longer, it is essential to detect the early population surge within 24 hours of the initial beetle build-up. Once this initial surge decreases, weekly monitoring should detect any fluctuations in beetle numbers. The second generation usually does not require treatment unless beetles are damaging the fruit. Admire Pro and Platinum can be applied at planting for control of striped cucumber beetles on cucurbits. These products will provide about 3 weeks of control, depending on rainfall and rate of plant growth. However, these products should not be counted on to provide complete control when striped cucumber beetle populations are high. Foliar applications of insecticides may also be needed. These soil insecticides will provide very little control of seedcorn maggots. Admire Pro and Platinum will also control aphids. Because watermelon is not susceptible to bacterial wilt, insecticides should only be applied when an average of 5 or more beetles are feeding on each plant (Table 2). Once the initial early flush of beetles is gone, any further foliar insecticide applications should be unnecessary, unless they are feeding in large numbers on developing fruit. Growers should be aware that use of some foliar insecticides may increase problems with aphids and mites. 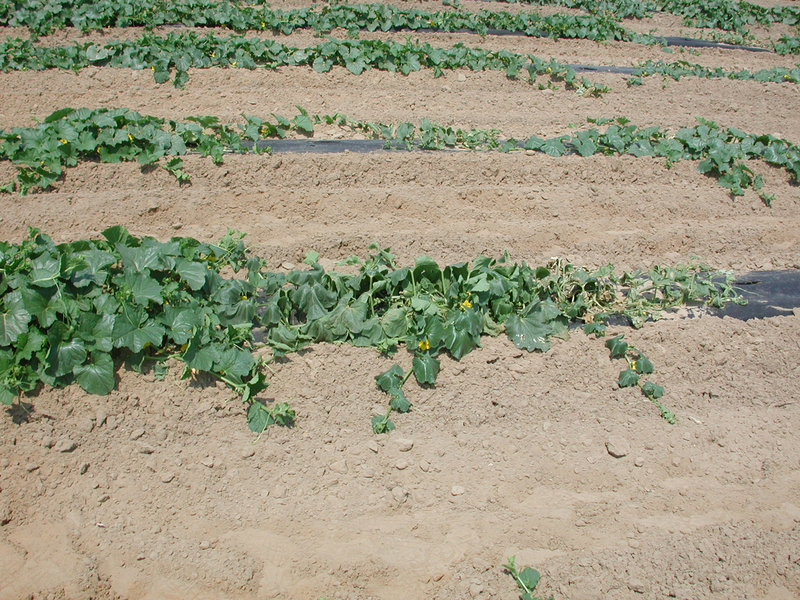 Cantaloupes are very susceptible to bacterial wilt and, therefore, little feeding damage can be tolerated. Once a plant is infected with the bacterium, the disease cannot be controlled and the plant will die. The only way to avoid the disease is to prevent beetles from feeding on the plants. Plants should be watched closely for the first wave of beetles any time after transplanting. If an average of more than 1 beetle per plant is observed feeding on cantaloupes, an insecticide should be applied. Growers can expect 3 days of control from Sevin XLR and 5-7 days from the other insecticides recommended (Table 2). Pollinators, including but not limited to honey bees, are critical to the production of melons. Many producers contract with beekeepers to provide bees to improve pollination. Maintaining the health of pollinators ins important for both melon growers and beekeepers. Most of the insecticides used to control striped cucumber beetles have some level of toxicity to pollinators, and some are extremely toxic. Sevin is highly toxic to honey bees. The problems may be worse when sprayable formulation are used because the particles are carried back to the hive where they accumulate and impact the entire colony. Therefore, we only recommend Sevin XLR+ for use on cucurbits. Pyrethroid insecticides (Ambush, Asana, Baythroid, Brigade, Danitol, Mustang Maxx, Pounce, and Warrior) are very toxic to pollinators but usually kill workers before they return to the hive, so the only affect is reduction in worker numbers. For both Sevin and the pyrethroids, applications made when flowers are present should be made in late afternoon or evening when the flowers have closed. This will limit the exposure of pollinators to these insecticides when new flowers open the next morning. The neonicotinoid insecticides (Admire Pro, Platinum, FarMore seed treatment, Actara, Assail, and Belay) are systemic, meaning they move through the plant. No matter how they are applied, the insecticide will move to the flowers and the pollen. Foraging pollinators will therefore contact significant residues of these pesticides. Growers should be aware that the insecticides in Admire Pro, Platinum, FarMore, Actara, and Belay are all highly toxic to pollinators and have the potential for harm. Data show that using the low end of the labeled rate range results in lower residues while providing similar levels of control compared to higher rates. FarMore treated seeds result in toxic residue levels in pollen, but provide no control of SCB when plants are grown in the greenhouse before transplanting into the field. Direct-seeded FarMore treated seed will provide about 3 weeks of control of SCB. Assail is much less toxic to pollinators and can be used with little potential injury to pollinators. Table 3. Foliar insecticides recommended for striped cucumber beetle control on watermelon and cantaloupe. Actara 25 WDG 3 - 5.5 oz. 0 Do not exceed 11 oz. per acre per season. Ambush 2 EC 3.2 - 12.8 fl. oz. 0 Do not exceed 102 fl. oz. per acre per season. Asana XL 5.8 to 9.6 fl. oz. 3 Do not exceed 48 fl. oz. per season. Assail 30 SG 2.5 - 5.3 oz. 0 Do not exceed 5 applications. Baythroid 2.4 - 2.8 fl. oz. 0 Do not exceed 11.2 fl. oz. per acre or 4 applications per season. Belay 2.13 SC 3 - 4 fl. oz. 7 Do not apply during bloom. Brigade 2 EC at 2.6 - 6.4 fl. oz. 3 Do not apply more than 19.2 fl. oz. per acre per year. Danitol 2.4 EC at 10.67 - 16 fl. oz. 7 Do not exceed 42.67 fl. oz. per acre per season. Mustang Maxx 2.8 - 4 fl. oz. 1 Do not exceed 24. fl. oz. per acre pr season. Pounce 25 WP at 6.4 - 12.8 oz. 0 Do not exceed 3.2 lbs. per acre per season on cantaloupes or 4.8 lb. on other curcurbits. Sevin XLR Plus at 1 qt. 3 Some phytotoxicity may result when carbaryl is applied during hot, humid weather, especially on seedlings and newly set plants. Carbaryl is highly toxic to bees visiting blooms. Warrior II 1.28 - 1.92 fl. oz. 1 Do not exceed 11.5 fl. oz. per acre per season.